Most successful traders know that trading mistakes are extremely easy to make and can be very costly. The challenge for most private traders is that it can be a very solitary occupation, many traders are self taught and learn from the school of hard knocks... Also known as learning from your mistakes. Many books and websites will tell you what you need to do to be profitable, but without experience of your own, it is difficult to find really great (and entertaining) explanations of what NOT to do. I am passionate about learning from my mistakes... But I am even more passionate about sharing my mistakes so that others may learn from them, and also learning from other peoples mistakes to improve my trading and profitability. Trading mistakes - are they really a big deal? YES trading mistakes are a big deal! That is if you want to remain in the game and grow your account exponentially. Let's use a couple of examples to illustrate just how important it is to minimize your mistakes. Many new traders assume they understand what is required for success in the stock market, however, this assumption can be the biggest mistake of all! I like to view trading as a constant journey in which I am always trying to uncover more mistakes and open my mind to new concepts. With that in mind, lets look at the impact different types of mistakes can have on your trading account. Scenario is that on every trade you place you make a systematic error which costs a small amount of money on each and every trade. An example might be using market orders which give you more slippage than you intend (get you into the trade at a slightly worse price than you intend). 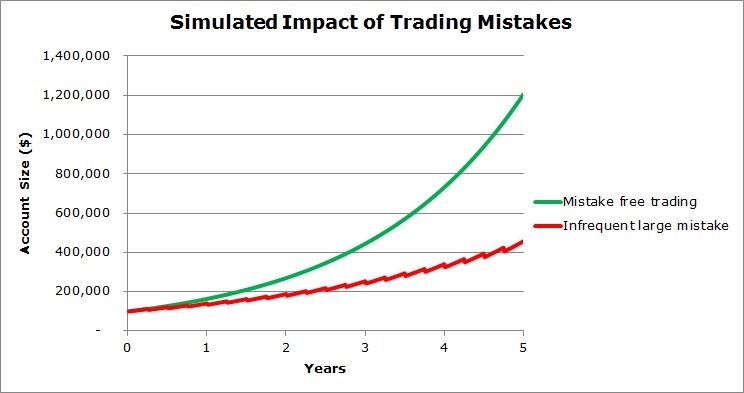 Let's say you have a $100,000 account, risk 1% per trade and your average profit per trade is 0.5 times what you risk (before the impact of mistakes). Your system trades 100 times a year. Because of the mistake mentioned you incur additional slippage of 0.1 times what you risk (i.e. 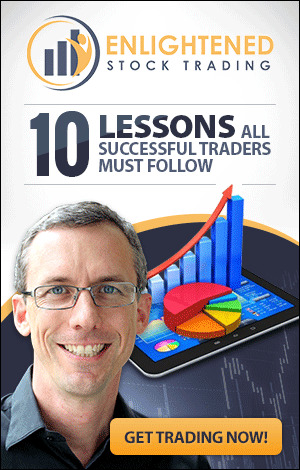 If you risk $1000 per trade, it is a $100 mistake). The chart below shows the impact of trading this hypothetical system with and without this mistake over 5 years... The impact is almost unbelievable... Except sloppy trading habits and small systematic mistakes like this are VERY common. If you eliminate systematic mistakes like this you will dramatically improve your trading system results. Pay attention to every detail - Every little edge makes a difference! The lesson in this example is clear - pay attention to the details and place each and every trade with care - avoid small mistakes because they really add up over time to a massive opportunity cost! Using the same trading system profile as above, let's evaluate the impact if an infrequent large mistake. An example of this might be you forget to place a stop and don't properly monitor your trades so every now and then a trade moves a long way against you before you get out. Let's assume for these purposes that a once every 3 months you make this mistake, and each time you make this mistake it costs you 5 times your initial risk. The chart below shows the impact of this infrequent large mistake on your account over 5 years - again, the result is dramatic! Follow your trading system EVERY TIME YOU TRADE! Traders who don't do this will inevitably make large mistakes like this and will suffer the consequences. 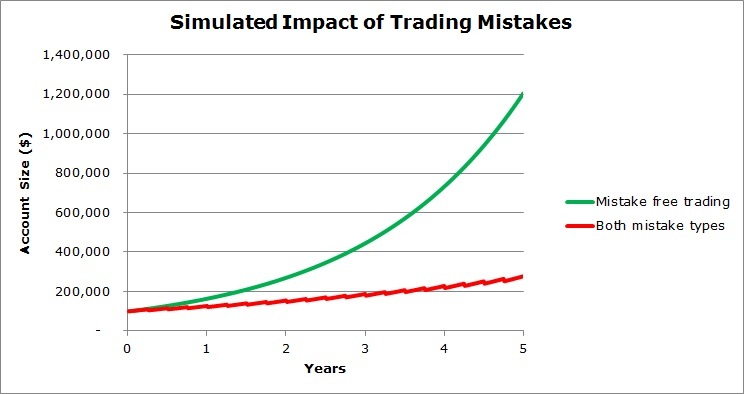 Compounding Mistakes - Why most traders probably fail! Realistically, most new and experienced (but as yet unsuccessful) traders are probably making both systematic and infrequent large trading mistakes. If you are not yet massively successful in your own trading and you honestly assess your own performance it is highly likely that this is the case for you. The trouble with making multiple mistakes, no matter how small or infrequent they are, is that the mistakes compound on each other to cause catastrophic damage to your account relative to mistake free trading. As you can see in the simulation below, combining both hypothetical mistakes listed above has a heart breaking impact on your trading results. What mistakes are you making that you know about? What mistakes are you making that you DON'T know about? How can you eliminate them as quickly as possible? We suggest you review our Common Trading Mistake Listing and evaluate yourself and then progressively eliminate your mistakes as discussed below. 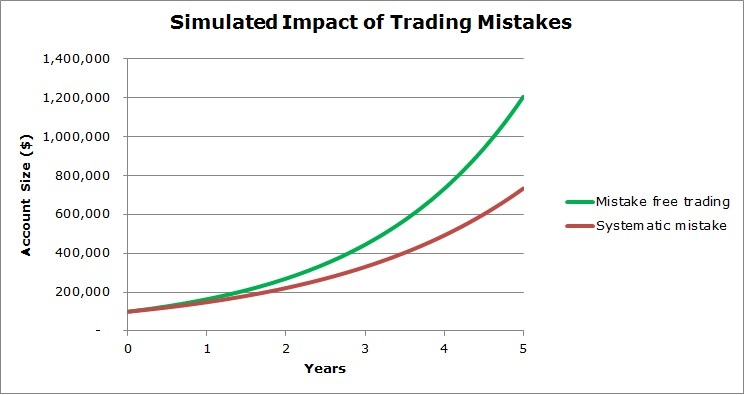 How can you eliminate mistakes from your trading? The vast majority of trading mistakes are psychologically driven in some way. Getting your personal psychology right is therefore likely to dramatically improve your trading results because you will make fewer and fewer mistakes in your trading. Personal psychology issues may include things like the desire for excitement; subconscious desire to punish yourself for something; fear of success; poor self esteem; thrill seeking behaviour and many other sources. Getting to know yourself, developing peak performance that eliminates or mitigates this sort of issue is extremely important in order for you to realise your full potential. 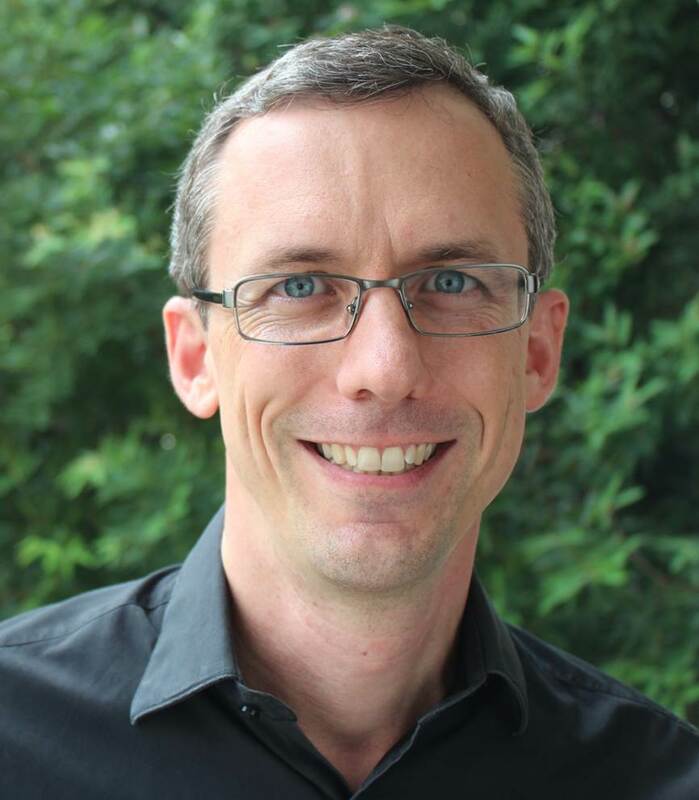 One course that is extremely beneficial to help Traders improve their results in this area is Van Tharp's Peak Performance Course for Investors and Traders. This home study course is an excellent resource for all traders and investors to identify and overcome self-sabotage.